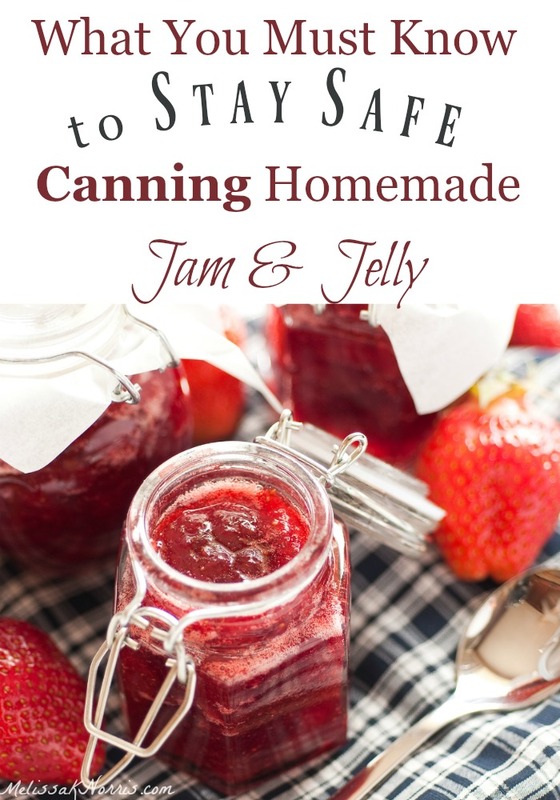 Learning how to stay safe with canning homemade jam and jelly is extremely important. While I love canning and Mason jars, I want to make sure the recipes I’m using are safe, and I want the same for you. I’ve been getting a lot of questions lately and though this was the perfect time to address them. Listen in to the Pioneering Today Podcast, inspiring your faith and pioneer roots with old-fashioned skill sets and wisdom in a modern world. Learn about homemade herbal remedies to keep you and your family safe while embracing the natural items while you’re mucking out the barn, working in the garden, cooking up supper, or driving in your car… or any task you’re doing, we’re happy to be there with you! Can I use any fruit to make jam or jelly? In order for a food to be safe for water bath canning, it must fall on the ph scale at 4.6 or lower (the lower the number the more acidic). The reason for this is because botulism can’t grow in an acidic environment. Most fruits are acidic and safe for canning with the exception of bananas, figs, melons, dates, and papayas. However, some fruits can be borderline, especially when ripe or overripe (use 1/4 of under ripe fruit for higher levels of pectin) so you’ll need to add 1 Tablespoon of lemon juice per cup of fruit. Can I make the jam or jelly into freezer jam? Yes, you can take any canning recipe and instead of processing it via the hot water bath, simply jar and freeze. However, you cannot take any freezer jam recipe and turn it into a canning recipe. Canning recipes must have the proper acidity level and no added ingredients like chia seeds that don’t have tested recipes and times for canning safety. What is the role of sugar in home canned jam and jelly? Sugar doesn’t make a canning recipe safe, refer back to the acidity level. But sugar does act as a preservative in the jam or jelly. Sounds like a contradiction doesn’t it? The sugar acts as a preservative in two ways. The first way is it helps the jam/jelly or fruit retain its color while it’s on the shelf. The second way is sugar has an osmotic effect, meaning it reduces the amount of liquid thereby inhibiting bacteria growth. Your opened jars of jams and jelly with sugar in them will last longer in the fridge than those without or lower amounts. For this reason I usually don’t can most of my jams and jellies in anything larger than a jelly jar so we’re sure to go through it in a few weeks once it’s opened. This will depend upon the size of your family. Can I use honey to can with? Yes, you can use honey, but I don’t because I can all of my jam and jelly to leave room in my freezer for our beef, pork and chicken (all raised here on our homestead). I use raw honey and the heat to make the jam and jelly and process it destroys the benefits of the raw honey. What if I want to make sugar free jam or jelly? You’ll need to use a pectin source like Pomona’s Pectin that has calcium water to help with the set instead of sugar. Why do I need to process my jam or jelly in a hot water bath when I get a seal with out doing that? Processing your jam or jelly in a hot water bath helps make sure there aren’t bacteria or mold spores in your jam or jelly. You went through all that work to make a homemade product why wouldn’t you take the extra 10 minutes to make sure it’s safe and shelf stable according to tested science and research? A seal doesn’t mean your product is safe, it simply means a vacuum was created. Want to make sure you’re home canning is safe? Get access to our Home Canning course. You belong in the Pioneering Today Academy and our Home Canning with Confidence e-Course here. Why don’t you use commercial pectin? Personally, I don’t use any commercial pectin except Pomona’s Pectin occasionally for a three reasons. It’s an extra expense, enough said. Commercial pectin is processed and I prefer the least amount of processing as possible. A lemon, lime, green apple, or crab apple is much cheaper and unprocessed. Commercial pectin contains dextrose, which is made from corn…. aka, one of the highest GMO crops.